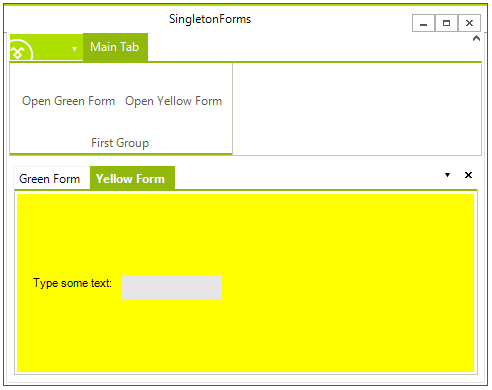 A typical scenario for an application showing many forms is to allow the end-users to get each type of form displayed only once. In addition, if the end-user tries to close a form it should become hidden instead of really closed and disposed, because this allows the developer to easily save the state (entered data) of the 'closed' forms. In this article we are going to demonstrate how you can implement that type of behavior with forms and RadDock. The forms used in this article are standard forms that do not follow the real singleton pattern. The word 'singleton' in the approach is used only to describe the behavior of the form from the end-user's point of view. Let's assume that we have a RadRibbonForm with two buttons each of which opens a specific type of form that lies in RadDock. Let's call these forms YellowForm and GreenForm. If a form of particular type is already opened, clicking the button that has opened it will not open any new forms of the same type. If the end-user closes the form after filling-in some data, clicking the 'show' button for this form will open the form with the data filled-in. 1. For each of the types of forms that we create, we should create a corresponding DocumentWindow/ToolWindow that serves as a container. Initially, global variables for the DocumentWindows/ToolWindows should be defined without creating new objects.